RealGifts purchases gifts wholesale and puts them on the application for people to purchase and send to their friends on Facebook. 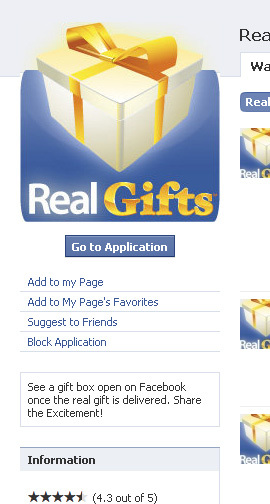 Instead of getting those fake gifts that everyone sends around on Facebook, you can send and receive actual real gifts. Common gifts are teddy bears, chocolates or gag gifts like finger-traps or whoopee cushions. I worked with the Facebook API to integrate seamlessly into Facebook. I worked with other API's such as Authorize.net, our payment gateway, so we could charge customers' credit cards and to set up accounts so customers could save their credit card information in a secure manner. The whole order process was done over HTTPS which encrypts all the packets going back and forth for ensured security. I created a backend inventory system to track who ordered what and where it was shipped to. I also created custom analytics for the app. I made a gift selector to make it easy for customers to page through gifts. They can filter by category, price, name or popularity. I designed the box on the home page which shows up on a Facebooker's profile page. I also made the app more viral by connecting it to the customer's news feed on Facebook so when they sent a gift it would appear on their profile page. I automated several processes between us and our vendors. When someone orders something on our site, the order goes to the vendor directly without our needing to send it to them.